As the old saying goes, "The more things change, the more things stay the same." Incredibly, back in 1931 people were complaining about shrinking office cubicle sizes. To wit: "At 'Broadcasting House' rooms measuring 8ft. x 6ft. are being coveted by the many people who will be condemned to labour in cubicles 7ft. x 5ft. The Civil Engineer himself, who helped to design and erect the building, works in a compartment in which, as the American said, 'You couldn't cuss a cat without getting hair on your teeth.'" ...and whoa!, dig this statement by the author regarding the demise of "local oscillators" in the UK (noisy regenerative Rx LO interference*): "Steps might be taken to ensure the survival of a few specimens, perhaps by the founding of a national reservation similar to those which accommodate the Red Indians in America. The few remaining squealers and their squaws could then re-radiate to their hearts' content." 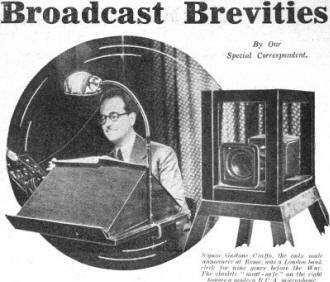 * Thanks to RF Cafe visitor Tim D. C. for the info: "Regarding the recent Broadcast Brevities from March 1932, where in it says 'regarding the demise of 'local oscillators' in the UK,' it's a reference to regenerative receivers when they spill over into oscillation and interfere with neighboring sets. This was common in the early days and the article was implying that the regens of old were slowly being replaced by newer technologies." THE B.B.C. staff must fight their own battles," remarked a genial listener to whom I had said that nearly everybody in Savoy Hill is dreading the day of removal to Broadcasting House. He added that staff discomforts, although regrettable, do not really concern the general public. Poor Accommodation at " B.H." Most readers will probably agree that he is wrong. A discontented staff is not likely to be efficient, and inefficiency on the staff side is bound, sooner or later, to affect the programmes and, consequently, listeners' enjoyment. So that, looking at the question from a purely selfish angle, I am sorry to find that the grumbles are growing. at Savoy Hill over the pitiful shortage of accommodation in the new building. Months ago, when people were making jocular allusions to the ship-like appearance of Broadcasting House, it was hinted that space would be at a premium, and now that the stage has been reached when rooms are being allocated to the various departments, it is becoming only too evident that the ship idea has been carried through to the bitter end. At "Broadcasting House" rooms measuring 8ft. x 6ft. are being coveted by the many people who will be condemned to labour in cubicles 7ft. x 5ft. The Civil Engineer himself, who helped to design and erect the building, works in a compartment in which, as the American said, "You couldn't cuss a cat without getting hair on your teeth." To put it candidly, the B.B-.C. have made a mistake in attempting to cram into Broadcasting House all those extra departments which were formerly "farmed out" in various odd buildings ill the neighbourhood of the Strand. The next move, I suppose, will be the demolition of the houses adjoining the new building to provide for the construction of annexes. It is at least comforting to know that there has been no cheeseparing in regard to studio space. Indeed, the size of most of the studios is such that very little use will he made of the auxiliary echo rooms. In most cases the engineers have found it necessary to introduce damping to cut down resonance effects, and Mr. Ashbridge promises that the general effect of transmission from the new studios will show a great improvement over those from Savoy Hill. The change-over begins on March 15th with the first broadcast of Henry Hall and the B.B. C. Dance Orchestra from Studio SA, and thereafter the new studios will come into use one by one. There is material here for a good guessing game if the B.B.C. could be persuaded to tell us at the end of each programme whether the studio used was new or old. R. HENRY HALL, the new B.B.C. dance band conductor, made a statement last Friday which should reassure those who feared that his programmes would be of a very restricted kind, " A lot of fuss has been made," he said, "over a chance remark of mine last January that I favoured 'sweet' music. It appears to have been interpreted as meaning that I intended to exclude other forms of dance music such as ultra-syncopated 'hot' jazz and the Vaudeville type." "This is quite wrong," explained Mr. Hall. "While my mandate is to provide dance music, listeners will probably find that there is no form of music played in the past by dance orchestras that the B.B.C. band will exclude from its repertoire." Talking of dance bands, many readers have reproved me more or less gently for daring to assert a fortnight ago that Henry Hall's would be the first dance band to include an oboe, Apparently oboes have been pressed into service since 1923 or thereabouts, and I must apologise to all concerned. And one reader suggests that the artiste whom I mentioned would feel far more flattered if referred to as a vocalist rather than as a singer. I had no idea that dance vocalists were so modest. STILL determined to make our flesh creep (and I am glad of it) the B.B.C. will begin in May a Saturday night series of talks, under the general title of "Hazard," in which notable adventurers will give us first-hand descriptions of their experiences. The subject seems as promising as "Escapes," which provided such an engrossing collection of true yarns a few months ago. The contributors will be famous sailors, soldiers, flying men, an Arctic explorer, and, also, if it can be arranged, a real gangster. I assume he will be on the retired list. RUNNING commentary on the England v. Scotland Rugby International match will be given by Captain H. B. T. Wakelam on March 19th, and relayed from Twickenham. ONLY 6,910 letters of complaint regarding local oscillation reached the B.B.C. 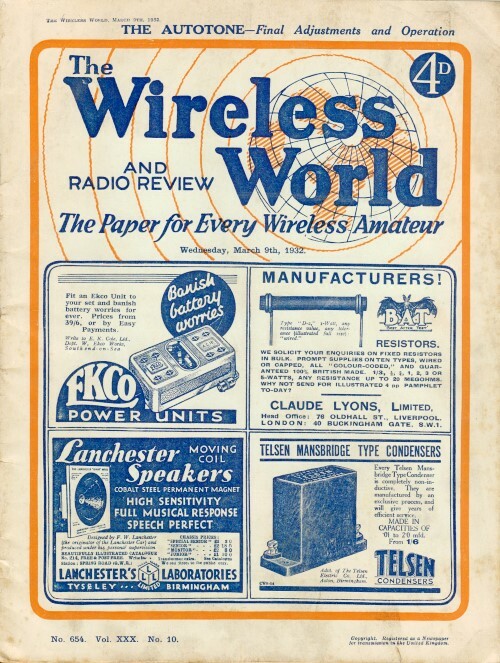 during 1931, as compared with 7,023 in 1930. This is not a big drop, but it is significant of the fact that oscillators are a slowly dying race. I hold no brief for the squealers, but there is always something sad in the decline of a popular movement. Steps might be taken to ensure the survival of a few specimens, perhaps by the founding of a national reservation similar to those which accommodate the Red Indians in America. The few remaining squealers and their squaws could then re-radiate to their hearts' content.